The word cenote comes from the Mayan voice dz’onot meaning “cavern with water”. The cenote is an underground chamber formed by dissolved limestone rock. As the cavity increases in size by action of rainwater, the cenote may end up rising to the surface by collapse of the roof. In the Yucatan Peninsula there are complex interconnections between the cenotes forming subterranean networks, which sometimes make their way to the sea. In these, the sea water, more dense than the sweet water, can go to the bottom of the system. For this reason, there are cenotes in which from a certain depth the water goes from sweet to salty. This contact surface between fresh and marine water is called “haloclina” and causes interesting visual effects. There are several types of cenotes around Tulum: open pit, semi-open and underground or grotto. This classification is related to the age of the cenote – the mature cenotes are those that are completely open and the young ones are those which still have their domes intact. Some cenotes have a rich variety of endangered freshwater flora and fauna. Some have also been artificially populated with new species. In areas very close to the coast you can find some saltwater fish such as snappers and mojarras, which arrive through underground currents that connect the bottom of the cenote with the sea. 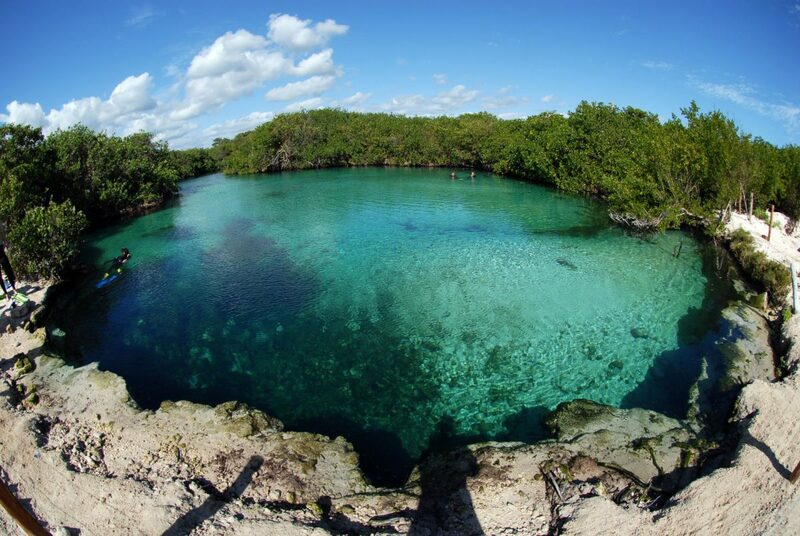 In Tulum, you can visit for example Grand Cenotes, Cenotes San Actún and Diving Cenotes. For about 35-50 Dollars you can dive in the water caves or hire snorkel and swim with turtles. A major attraction of Tulum and the Riviera Maya is the Barrier Reef, better known as the Mesoamerican Reef. It is home to a large number of species, including sea turtles. This barrier reef is the second largest in the world with a length of 1,000 km. The reef near Tulum is home to over 65 species of coral, 350 species of mollusks and more than 500 species of fish. It is estimated that about 1,500 manatees live on the reef, and northern areas are seasonal habitat for whale shark, the world’s largest shark. Whale sharks usually gather in groups in these areas to breed. Several agencies in Tulum offer reef snorkelling tours. They are able to pick you up in your hotel, drive you directly to the marina and then take you on a guided boat tour right to the reef where you can dive and fully enjoy the unique natural wonders. Tulum is easily accessible from the international Cancún Airport from which you could be transferred in 1h 30 minutes. One of possible means of transfer is shuttle to Tulum provided by www.tukankin.com offering not just private and VIP services but also economic shared shuttles. Transfers to Tulum are fast and very comfortable. Previous Previous post: Wanna Kiteboard? Let’s Go to Tulum!